Preterm or premature birth is defined by the World Health Organization (WHO) as a birth that occurs before 37 completed weeks of gestation. Having a preterm baby can be an extremely difficult time for a parent. This article aims to educate parents and help them deal with the rollercoaster of emotions. The causes of preterm birth are largely multi-factorial in origin. Social, psychological, and biological factors, all play a role in the cause. Previous experience of having a premature birth is a definite risk factor. Lack of consistent prenatal care and lower socioeconomic status are also some of the known factors. Your Baby is Born at 32-33 WeeksFor preterm births, it is likely that your baby will be admitted in the neonatal intensive care unit. Babies who have completed less than 35 weeks gestation go to the NICU by default. Moreover, babies who are born close to that mark still have trouble staying warm because they don't have enough body fat.Some babies also struggle due to the lack of fully-developed lungs. As a result, they need help breathing or to transition into the way their breathing is going to be. The majority of those babies also need to learn how to eat. The swallow reflex comes into fruition at the gestational age marker of 34-35 weeks. Those babies will need to learn that skill. They will be fed by a feeding tube and slowly learn to eat by mouth and then breastfeed hopefully.These process can take several weeks, and these babies tend to go home close to their due dates. But, there is no set time. The answer is when he or she learns how to stay warm, does not need any breathing machines, and is eating by mouth. Your baby is born at 28 weeks (or less)These babies tend to require a lot of technological and life support care. Most babies born within 28 weeks of gestational will need some help with breathing. A lot of them will end up on some sort of a respiratory support machine.All babies born that early will need help not just with feeding but with growth and gaining weight. We put central lines in and give them all the necessary proteins and sugars through an IV. Overall, babies born this early have a very long NICU stay. I often tell parents to picture the baby's due date, and that's the goal. This little person may surprise you and go home a little bit sooner than that, or, more likely than not, you'll be here a little bit past the due date.Each baby is different, and we try to prepare parents for every scenario. But, in the end, it's just going to be what it's meant to be. My best advice to the families is to be very patient, ask a lot of questions, and really be a part of the medical team. My best advice to parents is to keep the big picture in mind. There are a lot of people, and there are a lot of different teams and specialists treating your child. I would suggest picking one, two, or three people that you would like to get the information from. And, if your baby is in for the long haul, ask to have team meetings with the medical staff every week or every other week. Keeping an open line of communication is the most vital step in dealing with the situation. In a highly medical environment, parents feel that the doctors and nurses must know the best course of action. While this may be true, it is important to stay informed for your pieece of mind. So, ask us questions that you want answered. Ask us the things that worry you the most; because we don't know what those things are. The day-to-day life of a NICU is overwhelming. I would suggest that you look at the trend of your baby's care over one week's time. We can offer skin-to-skin care called as “Kangaroo Mother Care” (where the parent snuggles the infant) even with the sickest baby. There are only one or two types of machines that would prevent you from holding your baby. The smaller your baby is, the more skin-to-skin care we want. Just treating them as babies really helps. That's why you’ll see a lot of the NICU nurses dress up the babies. If you put on a little dress, it helps you bond and see that they're actual human beings. There's no such thing as too small of a person to care for. Be happy about it. You've been waiting to bring this baby home. So, just enjoy it! I think it's very difficult for parents to switch gears from being in the NICU. But, at some point, you will have to relax and focus on giving your baby a normal life. Trying to be overly protective or anxious at home doesn't do anyone any favors. We will never send you home with a fragile baby who we don't think is ready for the outside world. If anything, we're overcautious before we send babies home. They are at the same risk for getting a cold as anyone else. They're not any more fragile than a full-term baby. Surya group of hospitals are a pioneer in modern healthcare services for women and children since 1985. We offer cutting-edge facilities along with a staff that’s highly acclaimed in their field – including paediatric experts. To book an appointment in Mumbai with Dr. Nandkishor S. Kabra or call 022-6153-8989. 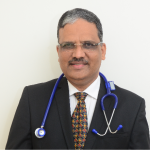 Dr. Nandkishor S. Kabra is a director at Surya Mother and Child Super Speciality Hospital. He holds an MBBS, MD (PAED), DNB (PED), DM (NEONATOLOGY), M. Sc (CLINICAL EPIDEMIOLOGY), MNAMS, FAAP. He is one of the top Neonatologist Doctors in Mumbai.